Kyoto designer Ryosuke Fukusada has created a ultra-thin wooden lightbulb using traditional Japanese lathe turning. 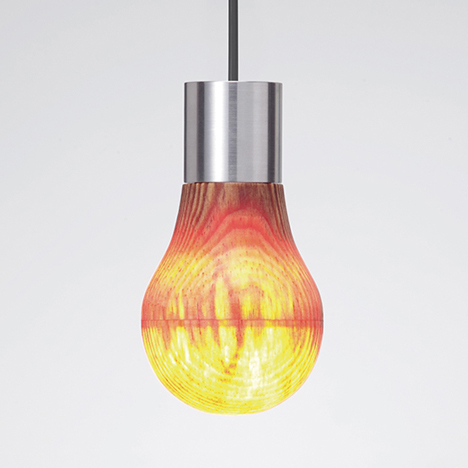 Shaped like a traditional lightbulb, Ryosuke Fukusada's design is made from 100-year-old pine. Using a technique called Rokuro, the wood is turned on a lathe using a bespoke knife until the walls of the bulb are between two and three millimetres thick, enabling the light from the LED inside to show through. The design is only made possible because LEDs stay cool enough to avoid burning the inside of the wooden form. Old pine is used because it becomes translucent at a thickness at which it can maintain its structural integrity. "The idea first came about in response to a design competition in Kyoto in 2009," Fukusada told Dezeen. "The brief was to create a new product by mixing craft with modern design to maintain traditional craft techniques that are disappearing because of modern industry." "I had a book that introduced craftsmen of Kyoto and their techniques and I found [craftsman] Yuki Ayabe and the Rokuro technique," he said. "After that, came up the idea to create the bulb together with the LED which is symbolic of modern technology." Working in collaboration with Ayabe, the first prototype took three days to make once the appropriate tools had been custom-manufactured. "Since it is handmade, Ayabe gets better and quicker one by one, so now it takes one and a half to two days to carve each bulb," said the designer. When switched off, the light looks like it's made of solid wood, and when switched on the LED illuminates the grain and patina of the wood. The limited-edition bulbs are made in collaboration with LED lamp supplier Ledon.